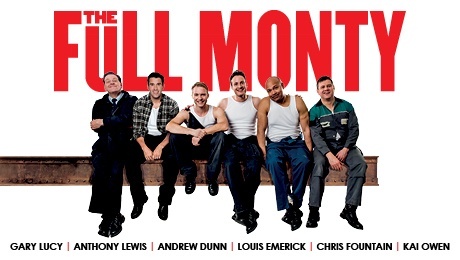 It's been a whopping twenty years since "The Full Monty" burst on to the big screen, becoming something of a phenomenon in the process, and now the stage version, written by the film's original screenwriter Simon Beaufoy, is once again touring the UK and it remains as socially timely as ever. Ostensibly the story of a group of unemployed Sheffield steel workers in the late 80s who decide to set up their own all-male strip group - whose unique selling point is that they go "the full Monty" - the play deals with a number of issues including sexuality, fatherhood, impotence and the societal pressures faced by employees and their families when unemployment strikes: when a person's identity, their pride and purpose, is inherently entwined with their employment status the search to regain those attributes can be a difficult one especially when one's own sense of worth can be damaged or repaired depending on how others see and treat you. Beaufoy's script is lean and tight, liberally laced with humour and great lines, and the varied plot-lines of the men are equally considered, though Gary Lucy's "Gaz" has the main thread and the relationship between him and his son "Nathan" Felix Yates is an emotional highlight. Indeed, Yates threatens to steal the show with a charming presence and engaging performance. Lucy comes off exceedingly well and he makes an admirable leading man. Another well-handled and beautifully performed subplot is that which involves Anthony Lewis and Chris Fountain which is surprisingly moving and is treated deftly by both writer and director. It's fair to say that the leading actors who form the male strip group are equally strong (Kai Owen and Andrew Dunn are especially solid pillars amongst them) and the bond they form together onstage is palpable. The ensemble are also nearly as uniformly well cast and are used well but succinctly. Jack Ryder's direction contains some clever, lovely moments and he handles his cast well. He also has a firm hand when it comes to the use of lighting and the disused factory set, including the scenic transitions which are almost from Poor Theatre, though he does make an error or two at the end of each act, including "Guy"'s 'reveal' and the abrupt curtain at the finale (the moment should be savoured a bit longer). A varied pace in the first quarter would also be welcome, but beyond these points he is a sterling director and ensures that there are nods to the original film peppered throughout. Given the social relevance and poignancy of the story it is a little disconcerting that many of the (predominantly female) audience treat the play almost as if it were "The Rocky Horror Show" (or worse - a Hen party) complete with call-backs and not always appropriate cheers. But that's not to take away from the pleasure and enjoyment one feels when viewing a play which, ultimately, has to be one of hope. And we all need a bit of that. The Full Monty is at the King's Theatre, Glasgow until Saturday 4th March. For tickets and information visit ATG Tickets.